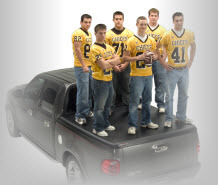 UnderCover Truck Bed Covers are among the lightest and strongest tonneau covers. Cover Weight : Approx 60 Lbs. Undercover Truck Bed Covers are lightweight, strong and have a low profile appearance. And you know, I’m personally impressed by anything you can put 6 football players on top of and it doesn’t collapse! At around 58 lbs dripping dry, Undercover Tonneau Covers, made of a composite of ABS plastics and Geloy install fast, are paintable, resist cracking, improve gas mileage and a whole lot more - just keep reading below. But the coolest thing for me about the Undercover truck bed cover is that it’s soooo easy to de-install and carry. In fact Undercover provides a wall mount bracket for you to hang your Undercover lid on in the garage while you’re not using it! 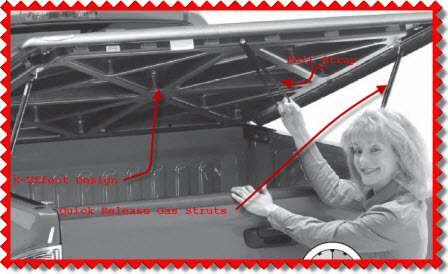 This feature is essential because, as with most hinged hard tonneau covers, the Undercover lid is not designed to be driven around in the upright position. The list of common features for all the Undercover Truck Bed Covers below is impressive. 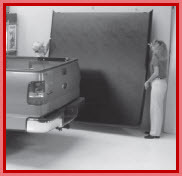 The UnderCover Classic Truck Bed Cover is stronger and lighter than fiberglass. It typically comes in a black textured surface that resists weather and forms a tight fit around your trucks bed. Underneath you can see UnderCover's patented X-Effect design that helps give this lid its strength. The dual lock system on the Classic is appreciated by some customers and not by others. Check out the customer reviews and find out how this tonno is ranked by hundreds of buyers. With all the features of the Classic the SE adds stylish ribbing and a curved spoiler. You also get a nice 3 LED battery powered light so as you can see inside your truck bed when you lift the lid of your Undercover Tonneau Cover at night. You get the same black textured surface like the Classic and the same great fit. Check out the customer reviews and see what real life buyers think of the SE. The UnderCover SE Smooth Tonneau is a ditto of the SE Tonneau with the exception that the top surface is smooth instead of textured. That's for all you arteests out there who want to paint this beautifully black tonneau cover a different color to match the factory paint of your pickup.